Weifang, located in central Shandong and renowned as the "Kite Capital of the World", is flying high with its recent bullish economic performance. Under the jurisdiction of Weifang Municipal Government are 4 districts, namely Weicheng, Hanting, Kuiwen and Fangzi; 2 counties, namely Changle and Linqu; 6 county towns, namely Qingzhou, Zhucheng, Shouguang, Changyi, Gaomi and Anqiu. 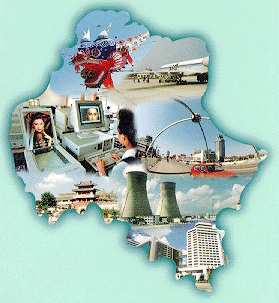 Home to more than 8 million people, Weifang is spread across a land area of some 15,900 sq km. The urban area of 1,472 sq km boosts some 1.2 million dwellers. The city has a temperate climate with an average temperature of 12 degrees Celsius and an annual rainfall of 700 mm. More than 40 types of metals and minerals can be found in Weifang. They include China's largest reserve of sapphire as well as gold, sulphur, iron, barite, granite and marble. Other resources are petroleum and natural gas. Weifang's output of bromine constitutes 75% of China's total, while its crude salt is 1/3 of China's total. Weifang is also rich in grains, cotton, tobacco, vegetables and fruits. It is a major vegetable production and distribution base in China. With its northern coastline bordered by the Bohai Sea, it is also a key production base of prawns in China. Weifang is well connected with other major cities via the Jiaoji Railway, which connects Qingdao to Jinan and the Jiqing Highway, which connects Jinan to Qingdao. The Weifang airport, which is linked to Beijing, Guangzhou, Shanghai and Hangzhou, has regular passenger and cargo flights. Weifang is well linked to other ports in Qingdao, Yantai and Rizhao. The construction of its own new 10,000-tonne port is in the pipeline. The first phase involves the building of 9 berths with an annual handling capacity of 5.5 million tons. As a major industrial base in Shandong, Weifang's main products are textile, machinery, electronics, chemical and building materials. Other industries being developed include power, coal, metallurgy, high technology, salt and marine chemistry. In addition, the State Council has designated the Weifang High Technology Industry Development Zone as a priority area for the development of high-tech industries. The 24.3 sq km zone will focus on information technology, marine chemistry, genetic engineering, environmental protection, health care and sanitation.